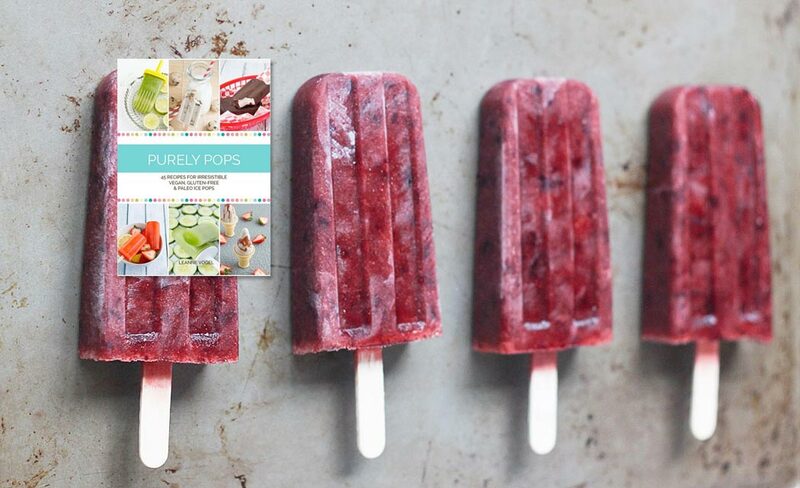 After scrolling through Leanne Vogel’s Purely Pops e-cookbook, my first response is, where are my ice-pop molds? I do believe that Vogel has done for the ice pop what Alice Waters did for vegetables—she’s shown that using real and fresh ingredients results in gourmet, gorgeous and delicious treats. 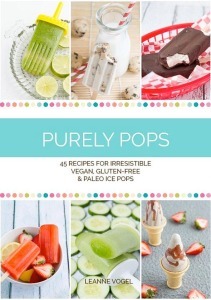 This book is a must for anyone who loves icy, creamy cold treats but wants vegan, gluten-free options. Vogel, a holistic nutritionist and author of the blog Healthful Pursuit, calls for two to four healthy ingredients in most of her pop recipes. The creamy pops rely on nut and seed milks for their consistency. A section at the beginning of the book offers recipes for the adventurous chef wanting to make these milks herself (which Vogel says create a more creamy result than the store-bought versions). Often, chefs turn to bananas for dairy-free treats to add creaminess, but Vogel doesn’t use them in any of her pop recipes: I don’t eat bananas; so, for me, that was a big plus. Sweeteners used include coconut nectar and maple syrup, although Vogel covers other options and conversion scales for those. Vogel also offers a nice Ice Pop Molds section, where she highlights her favorite molds available for making pops. There is a Tips section, but it doesn’t provide help for the problem I always encounter when making pops: the ingredients settle at the bottom. Purely Pops will entice readers with the gorgeous full-color photos we’ve come to expect from Vogel. Parents will have fun scrolling through the book with kids and choosing their next culinary creation. I know I will be enjoying this e-book with my girls for some time to come. We made the Chocolate Dip with Hemp Milk pops; check out our review and get the recipe!